I’ll be honest, when Hurricane Boats told me they wanted me to give their new centre console deck boat a whirl, I wasn’t sure what to expect. I have enjoyed running every other Hurricane I’ve driven and I am partial to the layout of the deck boat as it’s so roomy and functional. 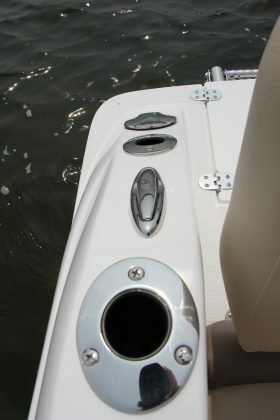 I also really like centre consoles, for different reasons though, namely for “fishability” features. I wasn’t sure how well the two would go together. It didn’t take long for me to be convinced. The classic Hurricane hull with the wide beam stretching right to the bow, the side sponsons and the deep-V centreline are smooth running and stable. It’s the same with the CC19, only there is no traditional helm, instead there is the console dead centre. 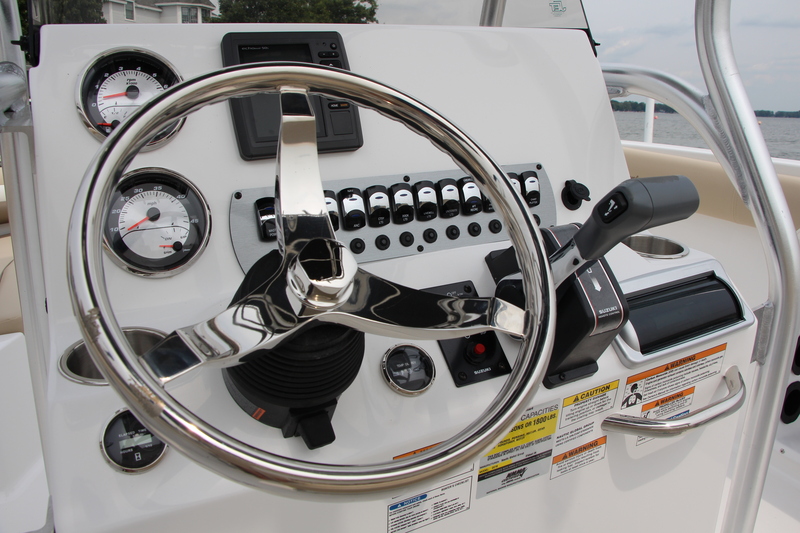 There’s a single line of rocker switches for everything from lights to livewells and, other than dual gauges on the far left of the console it is flat and wide open for you to customize with multiple flush-mounted multifunction displays and fish finders. 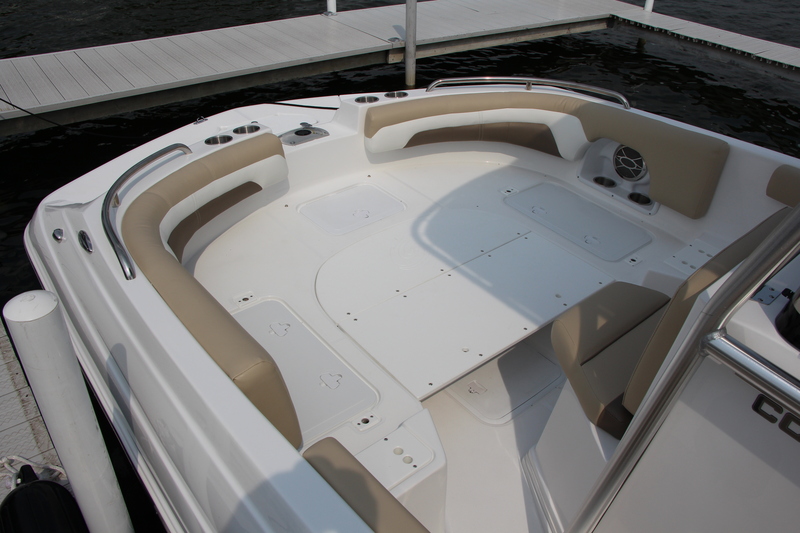 The convertibility of this boat was the most impressive I’ve seen in a long time – maybe ever. The bow lounge can be a traditional-style bowrider with dual benches, or you can fill in the centre and put two more cushions down to make a huge sun pad. 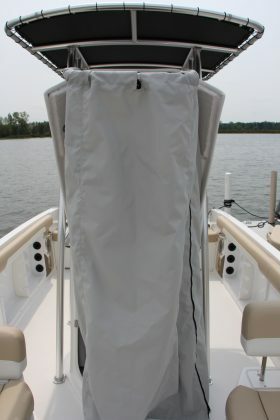 For fishing, remove all the cushions and you have a big casting platform with a seat base for a fishing seat. The rear bench backrests should win an award, but we’ll cover that in the fishing features. The captain’s chair isn’t really a chair, but a full size cooler with cushion fitted on top. The backrest can be moved forward to serve as a standing support as well. 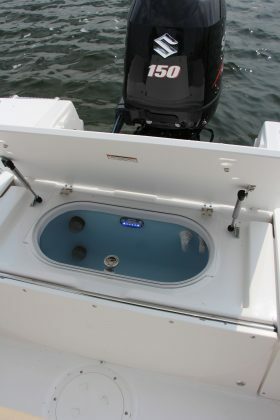 The front of the console lifts up, revealing a roomy privacy chamber with space for port-a-potty or to be used as more storage. I wasn’t sure what Hurricane had in store with the CC19 but by the time I was done on our test day I had sent my wife about a dozen photos and I didn’t want to surrender the keys. Safe to say my earlier doubt was erased. Deck boats and centre consoles go together perfectly. 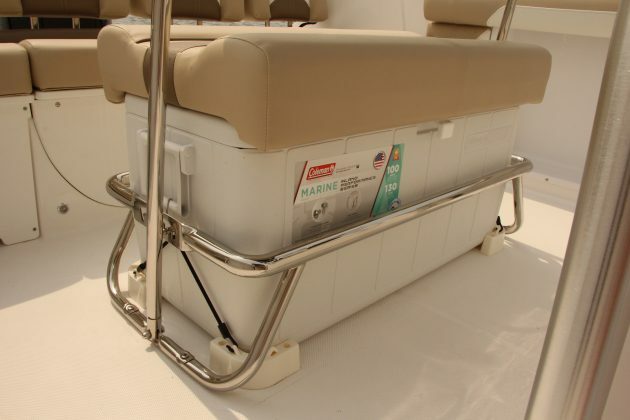 The people at Hurricane certainly have made the decision a lot easier for many fishermen looking for a more family-friendly boat. The CC19 has the best of both worlds: the features required for a demanding angler and more than enough comfort to spend an afternoon with the family. The space on this boat is incredible once it’s converted into fishing mode, thanks to the wide beam from stern to bow. 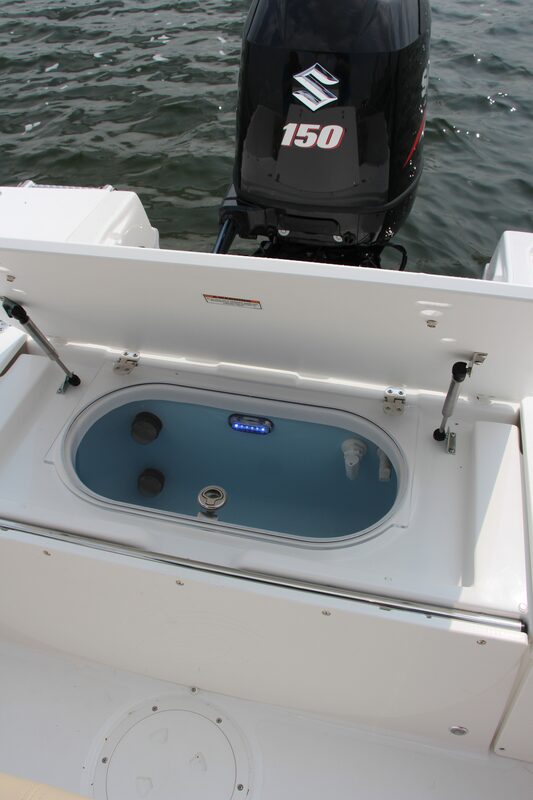 The forward deck has ample room for multiple anglers as well as plenty of storage, and space for a bow mount motor. 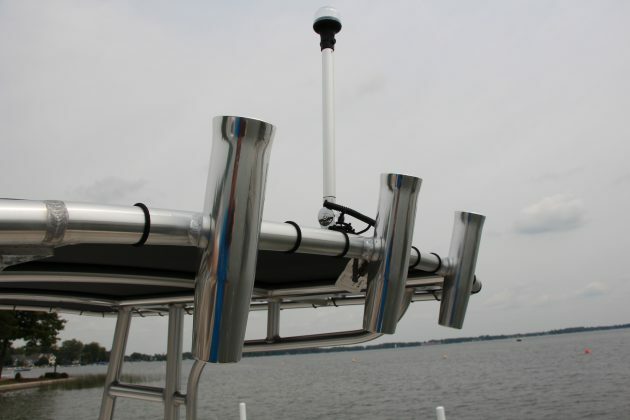 Open rod storage on the port and starboard gunnels accompany three rocket launchers on the T-Top and two flush mount rod holders at the stern. The console is well laid out with the instrument cluster at your fingertips and, as Steve mentioned, there is plenty of room for electronics. The stern casting platform is another great feature with plenty of storage, and when the seats are removed, they are stored in their own designated space along the gunnel below the combing pads. A clear glass lid on the aerated live well is a nice touch as well. 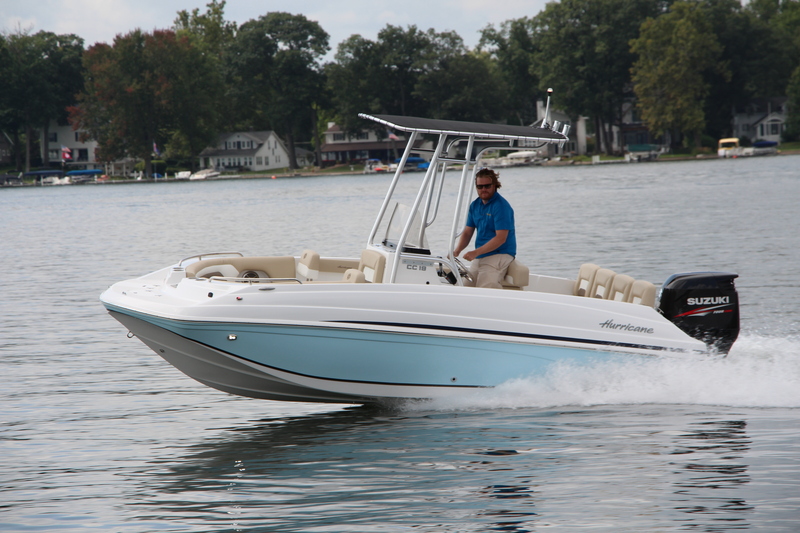 The versatility of the Hurricane CC19 is impressive; it has the capabilities of going on a fishing trip one weekend and staying at the cottage the next.